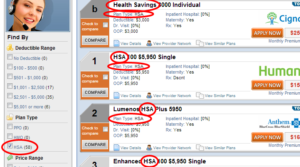 I clicked the “Get Quote Now” button to the right, then selected “HSA” for “Plan Type”… “PPO (0) – HMO (0)” ??? That’s confusing too! PPO and HMO are network types and HSA qualified has nothing to do with networks. HSA qualified plans can be PPO or HMO. In Colorado, all individual health insurance is PPO, except for Kaiser Permanente. They’re the only individual/family HMO. That same IRS link also explains how you can switch to an HSA qualified health plan anytime up until December 1 and still be eligible to contribute the maximum annual amount to an HSA for that year. But then you must keep that HSA qualified health plan for the entire next year or else you have to include in your income (ie, lose the tax benefit of the HSA) any money that you wouldn’t have been able to contribute to the HSA the previous year if contributions had been prorated based on the amount of time you had the HSA qualified plan (the IRS site gives specific examples if this isn’t clear). So you can wait until later in the year to enroll in an HSA qualified plan and establish and HSA, and still be able to max out the HSA for this year. But then you have to maintain that HSA qualified health coverage for the following full year. Much of the confusion around this topic likely stems from the fact that nobody really goes around checking up on HSAs. Unless of course, you get audited by the IRS. In which case, you definitely don’t want to have to explain to the auditor why you have six years worth of tax-free contributions sitting in an HSA, and you’ve never had HSA qualified health insurance. But in terms of the logistics of setting up an HSA account administrator, most people do that through a financial institution rather than through their health insurance carrier. And the financial institutions generally don’t ask for proof of HSA qualified health insurance coverage. It’s up to the person opening the HSA to be aware of the rules and to make sure they have an HSA qualified HDHP in place prior to setting up the HSA. If you’re interested in the tax benefits of an HSA, it’s definitely an option worth considering. But just make sure that the first step you take is to get yourself a health insurance policy that specifically says it’s HSA qualified – either through your employer or in the individual market. Once that step is complete, you’re free to shop around at various financial institutions and find an HSA that best matches your investment goals. But if your health insurance is not HSA qualified – even if it’s a “high deductible” plan – you can’t set up an HSA until you change your health insurance plan. If any of this is confusing, please let us know and we’ll be happy to help clarify it.